Happy Monday everybody! We hope you had an excellent Easter holiday! I made these beauties the other afternoon to go with the pasta dinner I had planned for that evening. They turned out fantastic and will be a staple at our home from now on!!! I think next time, I will make them smaller and more like a breadstick! Can't wait! Pour warmed milk and yeast into a medium bowl and set aside for 10 minutes. Meanwhile, in a large bowl, mix the flour and salt together. Add the canola oil and warmed water to the yeast mixture. Now pour the yeast mixture into the flour/salt mixture and begin to knead with your hands in the bowl. This is where you can start to add more flour if the dough is to wet to handle. The dough should be stiff and only slightly tacky, but won't stick to your hands. Knead it in the bowl until it is mostly smooth. Now, cover the bowl with tinfoil and allow it to rise for 1 hour in a slightly warm place. Once the dough has risen for an hour, uncover it and punch it down and knead it for one minute. Now cut your dough into as many pieces as you would like. I was able to get 19 generous sized rolls. Roll the pieces of dough into the shape you would prefer. I did a "mini loaf" shape but rounds would work great too! 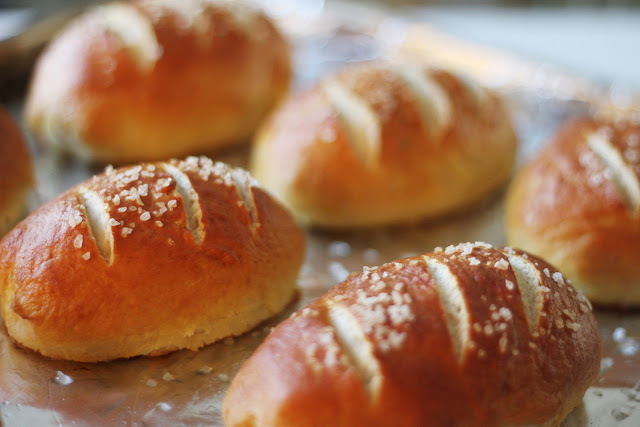 Place the shaped rolls on a greased surface to rise for 15 minutes. 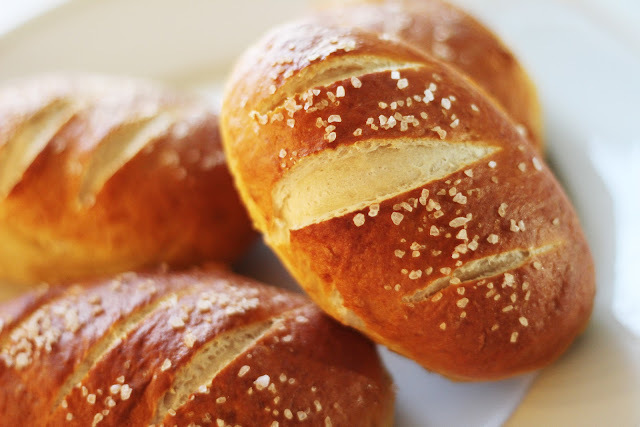 While your rolls are rising, preheat your oven to 400 degrees and start your roll bath. In a large pot, bring the water, salt and baking soda to a rolling boil. Drop 3-4 rolls into the water and let them "poach" for 1 minute. Try and keep them submerged as much as possible. Use a slotted spoon to scoop them out and place on well-greased cookie sheets. Using a serrated knife, cut shallow lines across the rolls and sprinkle with coarse sea salt. Then into the oven for 20-25 minutes until rich and brown. Wow, these look picture perfect. I wonder how they'd be dipped in a little mustard, Germany street food style? Yum! Oh man I want those right now! looks so yummy! Wow, those look delish, especially with some mustard!